This simple recipe for skillet sausage and veggies is a great dish to have in rotation for those busy weeknights where you need something easy and quick that you can throw together. And since this is all done in one skillet it makes cleaning up a breeze. Although I do have an ingredients list and directions, this is a very forgiving recipe. You do not have to follow it exactly. The other nice thing is that you can use such a variety of ingredients, whatever you have on hand. If you do not have the ingredients I listed, feel free to omit, add, or substitute with what you have in your refrigerator, freezer, or pantry. The other reason I like this recipe is that it can be very vegetable heavy. In fact the more veggies you use, the better. Instead of having a meal where the meat is the main course, in this case the meat is the "side dish" and the veggies take center stage. In a large skillet cook the sausages over medium heat with about an inch of water. Cook for ~ 15 minutes. You want them almost all the way done with no pink in the middle. They will cook a bit at the end though. Once they are done, take them out and set aside. Turn the heat down to low-medium. Add avocado oil, onion, peppers, mushrooms, and other other veggies you have decided to put in but save the spinach or other leafy green until the very end. Add any spices you want as well. Cook the veggies until tender, about 10 minutes. While the veggies are cooking, slice the sausages into coins about 1/4 - 1/2 inch. Once the veggies are done, add the sausage back in and saute for another couple minutes. Right before serving, throw the baby spinach until for ~1 minute, until it is wilty. It will cook super fast so you really want to do it at the last second. That is it! 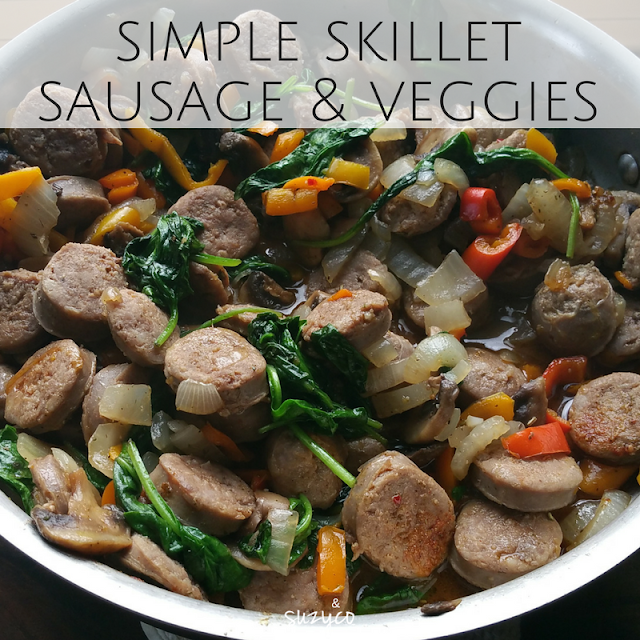 Simple, quick, and a great way to use up extra veggies. For more recipes, nutrition tips, and natural living tips, subscribe today!